Bodies are internally reinforced with synthetic material cloth and metal rings to assure a high mechanical resistance while operating at a positive internal pressure or vacuum. Rubber Expansion Joints are supplied from ND 1.1/4″ (32mm) up to ND 80″ (200mm), being recommended to operate up to 225 PSIG (16 Kgf/cm) and 250 °F (120°C), according to the specific model. For different models and other diameters, pressure and/or temperatures, please contact us. Compensation for displacements with small installation lengths and low spring forces. Corrosion resistant.High absorption of mechanical and sonorous vibration. Exempt of sealing joints.Not-welded end connections. Excellent ability to resist heat, water, weather and severe atmospheric conditions. Pumps, air compressors, blowers, etc. 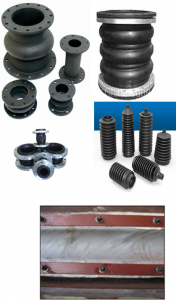 Any piping system where it is necessary to compensate thermal displacements.We supply a full range of standard and non standard rubber bellows and fabric bellows. Rubber Bellows compression moulded rubber bellows that provide the ultimate with nominal bore sizes ranging from 50 mm – 600 mm. Also known as rubber compensator bellows or dampeners, range of rubber bellows extend the lifespan of pipelines by not only providing flexibility but by also facilitating movement in the pipes without damaging or cracking the system. Flanged bellows vibration- and noise-reducing flanged bellows are rubber-reinforced with a synthetic polyester cord and are compression moulded to the highest levels of accuracy and safety – providing you with a durable, abrasion-resistant rubber bellow. Union-type, or twin-sphere, bellows from connect misaligned pipelines. Designed with a unique twin-sphere construction, this bellow facilitates greater flexibility in pipelines than regular, single-sphere bellows. The different rubbers employed in the manufacturing of expansion joints, are identified with circular coloured labels placed at external surfaces of bodies.